Additional research provided by Wynne Dough. The Carolina parakeet (Conuropsis carolinensis), now extinct, was found in large numbers in the region of the Carolinas and Virginia when the first European colonists arrived. Sir Walter Raleigh mentioned the bird in his 1596 book on the discovery of Guiana in South America, noting its similarity to the "paraquitos" of Central America and Italy. Captain John Smith, a leader in the settlement of Virginia in 1607, likewise made reference to parrots. When William Byrd surveyed the boundary between Carolina and Virginia in 1728, he was amazed at the large number of parakeets he encountered. "Carolina" became a part of the bird's everyday name sometime after the 1663 chartering of the Carolina colony. The Carolina parakeet was 12.5 inches long with a wingspan of about 22 inches. The bird was mostly green with an orange head, a yellow neck, and white legs, its tail feathers giving the impression of being long and pointed. Though skilled climbers, parakeets seemed reluctant to walk from place to place, instead going airborne even to turn around. Sometimes human traits such as laziness were ascribed to these birds. Their voice was said to be loud, harsh, and grating. Though generally not adept at speaking, occasionally the parakeet imitated sounds or words, and some trainers who began with very young birds were successful in teaching them to mimic a limited number of words from human speech. Parakeets were thought to mate for life and show signs of close attachment to their own kind. Some, in fact, were acclaimed "love birds." When a parakeet died or was killed, a host of chattering birds promptly surrounded its body. Although no evidence seems to suggest that these birds migrated, they often flew off together around their territory in such large flocks that they were said to have blotted out the sun. Carolina parakeets ate thistle seeds and cockleburs, birch buds in April, and beechnuts and chinquapins in the autumn. They also preferred to drink salty seawater when it was available. Orchards of European settlements were very appealing to flocks of parakeets, whose bills were ideal for splitting the fruit to get at the seeds. Raided orchards were stripped bare and the ground underneath covered with broken fruit that soon spoiled. The Carolina parakeet rapidly declined in the late nineteenth century. Landowners began hunting the birds, which had become pests and were also prized as food and for their colorful feathers, with which Victorian milliners decorated women's hats. Parakeets seemed to possess an uncommon degree of curiosity, and they appeared to be attracted rather than dispersed by gunshots. Their communal reaction to their dead also made them easy targets. In addition, the increasing human population in the rural regions of the southeastern United States began to deprive these birds of their natural habitat. The species probably fled North Carolina by the 1780s but may have lingered in South Carolina until the 1860s. 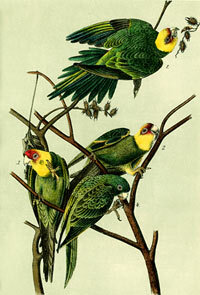 A few later reports of sightings from Tennessee, South Carolina, and Florida appear credible, but Carolina parakeets were described as endangered soon after 1900 and became extinct in the wild early in the twentieth century, the final captive specimen dying in the Cincinnati Zoo on 21 Feb. 1918. Alan Feduccia, Catesby's Birds of Colonial America (1985). Eloise F. Potter, James E. Parnell, and Robert P. Teulings, Birds of the Carolinas (1980). 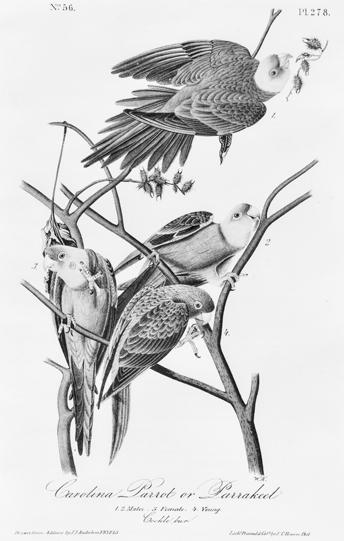 Lithograph of Carolina parakeets from a drawing by John James Audubon. North Carolina Collection, University of North Carolina at Chapel Hill Library. Carolina Parakeet. Image courtesy of the Cornell Laboratory of Ornithology. Available from http://www.birds.cornell.edu/AllAboutBirds/conservation/extinctions/carolina_parakeet (accessed October 30, 2012). 1 January 2006 | Dough, Wynne; Powell, William S.
Thank you for your question. Quoting from reliable sources to strengthen the argument of your paper is absolutely necessary, so, yes, you can most definitely use sentences from our articles. Communicate with your teacher how you should also refer to the sources you quote. Good luck with your work!